I grew up in Florida. I don’t live there anymore, but sometimes, I just can’t help myself – I need Cuban food. And Tennessee is not exactly a bastion of Cuban cuisine, so I have to make it myself. There a two things that just scream Cuban-o to me: Black Beans & Rice, and Cuban sandwiches (ham or pork, mustard, Swiss, pickles, on crusty white bread… mmmm!). I’ll usually get a craving for one or the other every month or so, but I’ve had a palpable lust for the black beans since last week. Thus, my home has been filled with the aroma of that spicy, vinegary, garlicky-ness of Black Beans and Rice today. There are lots of recipes out there, but my go-to recipe has been one I got from a friend years ago. A group of us from church met every Sunday evening for food (FABULOUS food! ), fellowship, and fun. Our kids were all either babies or toddlers at the time, so it wasn’t just Sundays that we met, we got together throughout the week too. It was like we were one giant family that happened to float ourselves and our kids from house to house on any given day. We mommies were exhausted and humbled by the how quickly each day went by, with seemingly nothing accomplished. Some days we could barely cobble together a dinner that didn’t consist of a certain macaroni that comes in a familiar blue box. 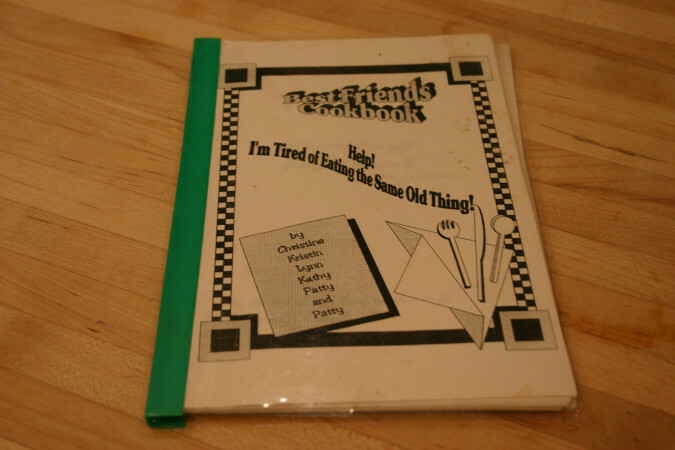 Lynn typed up the recipes, and put them into a little booklet titled Best Friends Cookbook. I’ve never really been one of those cooks that only had a limited recipe repertoire; I’m a foodie, and I love to try new things. However, there are some recipes that I just come back to time and time again. Don’t you? The ones we crave because they are our comfort foods. The foods that remind us of happy times, and special people in our lives. 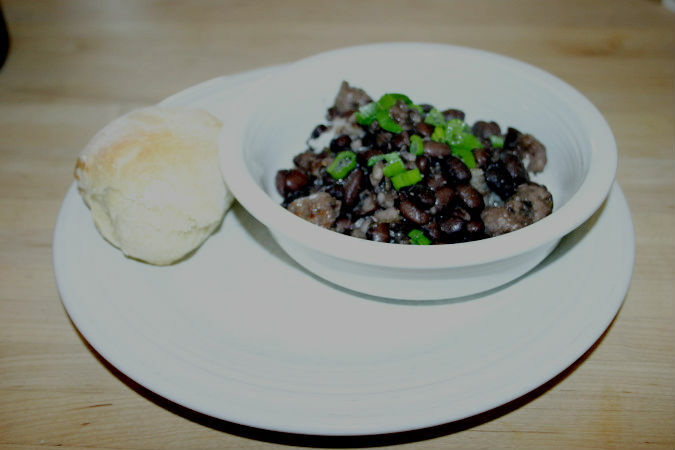 Lynn’s recipe for Black Beans and Rice is one of my comfort foods. It reminds me of my childhood, my young married life, and most especially, my Sunday/Monday/Tuesday/Wednesday/Thursday/Friday/Saturday best friends. Wash and soak beans overnight. Drain, and add the next 6 ingredients. Fill pot with water just to top of beans. Simmer until beans are soft. Remove quartered onion, pepper, tomato, and bay leaf, setting aside. In a saute pan, saute the remaining onion, pepper, and garlic in 1/2 C olive oil. Add oregano, cumin, and salt when onions are beginning to soften. When onions are translucent and soft, add red wine vinegar, stirring thoroughly. Add in Tabasco. Stir into beans, adding more vinegar, Tabasco, or salt to taste. At this point, the beans can be simmered over the stove for an hour or so. Alternately, the beans can be cooked slowly in a crock-pot for 4 to 6 hours. Cook white rice according to package directions. Serve beans over hot rice, garnishing with chopped green onions. Sweet Italian sausage is also an excellent topping! It sounds like a really worthwhile project, and I love that you’re considering setting it up to be charitable. Although I’m not from Cuba, black beans and rice is kind of like meatloaf in the US; everyone’s mom has their own recipe, so I’m fairly certain it’s close enough. I’ll be happy to include this in your project!